I’ve been really fortunate in the last couple decades to explore many of the farthest corners of the globe – thirteen straight years of sailing, chasing wind and waves on a series of kitesurfing expeditions, which included nearly two full circumnavigations, and the last couple years, paragliding all over the Alps, South America, Central America, Africa and the Himalayas. Just like surfers chasing swell, pilots chase seasons and weather. 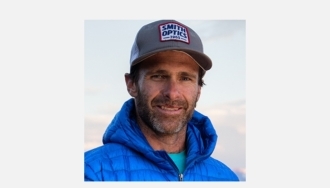 Reggie Crist, a former Olympic alpine skier and friend of mine who lives here in Sun Valley is even making a movie about how athletes are like migratory animals, hopping on planes or jumping in cars chasing what they “need” be it adrenaline, or escape, or just pure fun. Animals, of course, are seeking food and shelter, which is all we really need as well. But for some people this other “need” is as urgent as the next hit is for a junky. Without it we find life marginalized, gray and drab. I’d just gotten home from one such migration, a paragliding expedition with three other elite pilots across the Wasatch Range from Southern Utah to Jackson Hole, Wyoming – a line that had never been attempted. As a “vol biv” trip (i.e. fly/camp), which is very similar in approach to alpine climbing, where only the bare necessities are packed and we fly self-supported, carrying everything we need to survive for multiple days in our flying harnesses, it was totally unsuccessful. The weather just kept shutting us down. A late monsoonal flow from the south and too much instability in the atmosphere made flying long distances impossible. We had a film crew with us, documenting the expedition for Outside TV, which added further pressure. The trip wasn’t fruitless however – we got some great flying and some fantastic footage. We returned to Sun Valley exhausted but in good spirits. Cool fall nights and shorter days had already set in. The Aspens were already going golden. The tourists had left town. In my opinion, Sun Valley has the best big-air flying on Earth. A number of recent distance records, including my own world mountain record this summer of 240 miles, confirms this opinion. But what we don’t often get to do is fly here in the absence of fear. Flying in Sun Valley is usually a full-on affair. Crazy strong thermals and nail biting wind. It’s always kind of an edge-of-your-seat experience, or in our case, edge of your harness experience. But in the fall we often get days with very little wind and everything, including the thermals, has mellowed out. We can’t go huge distances as the days are shorter, but we can experience some stunning flying. My friend Matt (aka “Farmer”), who held the mountain distance record for a short period last summer, had a dream for many years to launch near town, fly out to the Pioneers – our closest range of radical mountains (about 15 miles as the crow flies) – top land at the Pioneer Cabin, which was built in 1937, and spend the night. The icing on the cake would be to launch the next day near the cabin and fly home. A proper bivy trip in maximum style, but a very tall order – one he’d tried before but never pulled off. In fact, it had never been done. I moved to Sun Valley just a year ago and had never even seen the Pioneer Cabin, and I couldn’t imagine just flying around in the Pioneers. 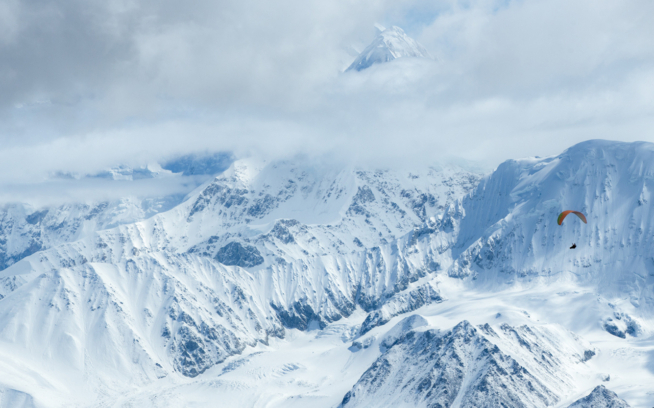 They are huge, black, some would say menacing, peaks rising over 13,000 feet – usually something we like to go over the top of with plenty of height and not look back. Not a place to hang around. But a day arrived that looked like perfect conditions to make the attempt. Wee little people in the big country. The stunning Pioneer Mountains of Idaho. I met Matt and two other local pilots, Donnie and Nate, at 3pm, right across the street from the historic Sun Valley Lodge. We were up at launch an hour later, legs and lungs burning but we were all smiles – the conditions looked perfect. In no time we were all off the hill and heading up the ridge towards Otto’s Peak, at the top of trail creek, various singing “beep beep beep” verifying glorious climbs. Cloudbase was nearly 15,000 feet and there was almost no wind. The thermals were gentle, the sky more clear and blue than I’d ever seen in the Wood River Valley, which stretches out to the great basin desert and winds up to Galena Pass, the gateway to Stanley and the stunning Sawtooth Mountains. After a horrific fire season and being evacuated from our home just a few weeks earlier, I couldn’t believe everything looked so pristine. The flying was so good I found myself questioning what was happening, and looking over my shoulder for the surprise that never came. Days like this come around very, very rarely. We made the jump from Otto’s, at the south end of the Boulder range over to the Pioneers and eventually all grouped up and flew right down the range. I discovered Matt had a GoPro with him and we spiraled down, deep into the range, tight into the terrain, something that would be suicidal in summer. We must have flown 40 kilometers out and back and then back out from one end to the other. Donnie and Nate decided to fly back to town after a flight that both would later describe as one of the best they’d ever had. Matt and I carried on until sunset, wondering if someone had snuck some acid into our lunch. This just wasn’t possible. Happy Farmer with the Pioneer Cabin in the background.